Al-Nood HA, Bazara FA, Al-Absi R, Al-Habori M. Glucose-6-Phosphate Dehydrogenase Deficiency among Male Blood Donors inSana’a City, Yemen. Oman Med J 2012 Jan; 27(1):46-49. Keywords: G-6-PD deficiency; Enzymopathy; Yemen. Glucose-6-phosphate dehydrogenase (G-6-PD) deficiency is the most common red cell enzymopathy, affecting 10% of the world population.1 It is transmitted by a mutant gene located on the X-chromosome and has a wide range of abnormal genetic variants. The G-6-PD enzyme functions to reduce nicotinimide adenine dinucleotide phosphate (NAPD) during oxidizing glucose-6-phosphate in hexose monophosphate shunt, and as NAPD is required for the formation of reduced glutathione, a defect impairs the red cell susceptible to oxidant stress that is often triggered by certain drugs, fava beans, or infections leading to premature red cell destruction, causing hemolytic anemia. Determining the prevalence of G-6-PD deficiency is an essential first step towards evaluating its impact on the health of a population. Since the study of Yemeni migrants may not accurately reflect the situation among the indigenous population; this pilot study was therefore conducted on male blood donors in the capital city, Sana’a, to determine the prevalence of G-6-PD deficiency among its residents, and to also obtain an indication of its overall prevalence in Yemen. Five hundred and eight Yemeni blood donors (aged 18 - 60 years) from different parts of the country living in the capital city, Sana’a, Yemen, who attended the Department of Blood Bank at the National Centre of the Public Health Laboratories (NCPHL) in Sana’a City were recruited into this cross-sectional study between January and August, 2009. Among the 508 donors, 136 were originally from the western coastal governorates, 346 from the mountainous governorates, and 26 from the eastern desert governorates. The NCPHL serves as a blood supplier for hospitals in Sana’a City. All the enrolled subjects in this study completed pre-donation questionnaires for history of anemia and jaundice, and had given their verbal consent at the NCPHL. The names and residential origin of the donors were also recorded. All the G-6-PD deficient samples, in addition to 30 blood samples collected from non-deficient blood donors as a “control group” underwent complete blood count (CBC) at the NCPHL on the same day, using a hematology analyzer (Mythic 18 5 part Orphée Company, Switzerland), in order to compare the hematological parameter values of the deficient with the non-deficient samples. The data were analyzed by the SPSS 17.0 computer program. The results were expressed as Mean ± SD for normal distribution. Differences in variables that were normally distributed were tested using the independent sample t-test. The level of significance was indicated by p-value <0.05. As presented in Table 1; hemoglobin (Hb), packed cell volume (PCV) and red cell count were significantly lower in G-6-PD deficient subjects than in the non-deficient (control) group, (p<0.05). 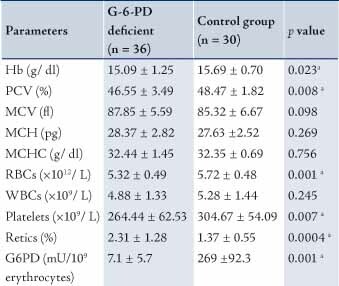 Reticulocyte count was significantly higher in the G-6-PD deficient group compared to the control group by 1.7-folds, (p<0.05). On the other hand, there were no significant differences in the means of mean corpuscular hemoglobin (MCH), mean corpuscular volume (MCV) and white blood cell (WBC) count between the deficient and non-deficient groups; with the means of MCV and MCH being higher and the WBC count being lower in the deficient compared to the non-deficient group. 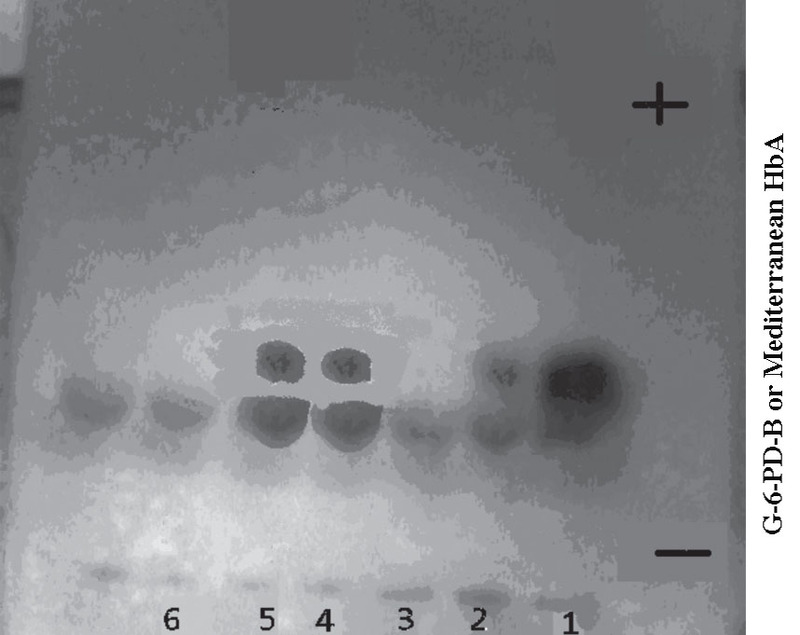 Figure 1: G-6-PD electrophoresis gel of severe deficient samples with G-6-PD activity 1.9, 2.1, 0.9, 2.9 and 3.4% of the normal in lane 2, 3, 4, 5 and 6 respectively. Lanes 2, 4 and 5 show G-6-PD-Mediterranean bands, whereas lanes 3 and 6 show no Mediterranean bands. Control in lane (1) normal Hb A and G-6-PD-B. Table 1: Hematological parameters in G-6-PD deficient and non-deficient (control) groups. a Indicates of significant results; Hb = Hemoglobin; PCV = Packed cell volume; MCV = Mean corpuscular volume; MCH = Mean corpuscular hemoglobin; MCHC = Mean corpuscular hemoglobin concentration; RBC = Red blood cell; WBC = White blood cell; G6PD = Glucose-6-phosphate dehydrogenase. Furthermore, of the 36 G-6-PD deficient samples; 5 were found to be microcytic (MCV: <80 f; range: 76.4-77.7 fL), hypochromic (MCH: <27 pg; range: 22.5-25.3 pg) and exhibited relatively high red cell count (>5.5 × 1012/L; range: 5.61-6.39 × 1012/L),6 with normal total Hb (range: 13.6-15.2 g/dL), thus suggesting traits of Thalassemia, giving a likely thalassemia trait prevalence of 13.9% among the G-6-PD deficient samples. This study represents the first attempt to evaluate the prevalence of G-6-PD deficiency in the indigenous population of Yemen and amongst people from different parts of the country living in the capital city, Sana’a. Glucose-6-phosphate dehydrogenase deficiency occurred in 7.1% of the population of blood donors attending the Department of Blood Bank at the NCPHL in Sana’a City, more than the figure obtained in Yemeni immigrants in the UAE reported by White et al.4 and lower than the 9.05% reported in the neighboring Saudi Arabia.7 The study also showed the predominance of severe G-6-PD deficiency class II. The results of the study suggest that G-6-PD deficiency is likely to be a health problem for the Yemeni population. A larger sample sized-study is needed to determine the overall prevalence of G-6-PD deficiency in Yemen. Using the screening fluorescent spot test to distinguish between G-6-PD deficient and non-deficient samples based on the activity level at 30% of normal could have lead to an underestimation of G-6-PD deficiency prevalence in this study; since at this level many moderate (>10 - <60% of normal), and all mild G-6-PD deficiency (>60% - <normal) subjects were not detected. Although the G-6-PD bands observed in this study were very faint or invisible, which is similar to those seen in most cases of G-6-PD-Mediterranean for Saudi subjects,7 and Kelantanese Malays,8 the phenotyping of these severe G-6-PD deficient samples (n=35) suggests the predominance of the presumptively G-6-PD-Mediterranean variant. The identification of this variant was supported by the very low activity of the G-6-PD enzyme (<10% of normal) found in these deficient samples, but also by the appearance of the bands for normal G-6-PD-B+ controls on the cellulose acetate plate, and the absence of anemia or jaundice history in any of these subjects, at least at the time of blood donation; however, none had presented documented records of their medical history. The results are consistent with these findings, since most G-6-PD deficient variants in the Middle East have revealed the G-6-PD Mediterranean variant and the predominance of G-6-PD Mediterranean variant among G-6-PD deficient individuals from the Gulf region have also been reported in earlier studies.7,9,10 This necessitates extending future studies to include DNA analysis in order to confirm these phenotype findings and to identify the G-6-PD deficiency variants among Yemeni people. Moreover, the 13.9% prevalence of the association of thalassemia trait with G-6-PD deficiency was not different from the overall prevalence of thalassemia trait in Yemen (13.3%),14 suggesting that there is no association between thalassemia and G-6-PD deficiency genes. This study represents the first attempt to assess the prevalence of G-6-PD deficiency and its variants in the indigenous population of Yemen. The prevalence rate of G-6-PD deficiency was found to be as high as 7.1% in the population of blood donors attending the NCPHL in Sana’a City, with the predominance of severe G-6-PD deficiency class II. These results suggest that G-6-PD deficiency could represent a significant health problem for the people of Yemen through the occurrence of hemolytic anemia under oxidative stress. These findings could raise the need for developing healthcare and educational programs to avoid and prevent the clinical symptoms and consequences of G-6-PD deficiency. This initial study shows that the prevalence of G-6-PD deficiency with predominance of severe G-6-PD deficiency class II are present within the Yemeni population at a prevalence rate that is likely to cause a significant health problem. A larger sample sized-study, including individuals from different parts of the country is needed to determine the overall prevalence of G-6-PD deficiency and within each region of Yemen. The study also needs to be extended to include DNA analysis for the identification of the G-6-PD variants. This will enable further insight into the likely variants of this disorder and will provide a firm foundation for population studies in different areas of Yemen. The authors would like to thank all the staff at the Blood Bank Department at the NCPHL, Sana’a, Yemen, for their cooperation. The authors reported no conflicts of interest, and no funding was received for this work. 1. Nkhoma Et, Poole C, Vannappagari V, Hall SA and Beutler E. The global prevalence of glucose-6-phosphate dehydrogense deficiency: A systemic review and meta-analysis. Blood cell Mol Dis 2009; 42: 267 – 278. 2. Beutler E. Disorders of red cells resulting from enzyme abnormalities. In: Williams’ Hematology, 7th ed, Lichtman, MA, Beutler, E, Kipps, TJ, et al. (Eds), McGraw-Hill 2006. p.603. 3. Central Statistical Organization. Statistical Year Book 2004, Republic of Yemen, Sana’a: Ministry of Planning and Development, 2004. 4. White JM, Byrne M, Richards R, Buchanan T, Katsoulis E, Weerasingh K. Red cell genetic abnormalities in Peninsular Arabs: sickle haemoglobin, G6PD deficiency, and alpha and beta thalassaemia. J Med Genet 1986 Jun;23(3):245-251. 5. WHO Working Group. Glucose-6-phosphate dehydrogenase deficiency. Bull World Health Organ 1989;67(6):601-611. 6. Gibbs G, Ntaios G, Rathod D. Separating thalassemia trait and iron deficiency by even simpler inspection. Am J Clin Pathol 2009 Oct;132(4):643-644, author reply 644. 7. Warsy AS, El-Hazmi MA. G6PD deficiency, distribution and variants in Saudi Arabia: an overview. Ann Saudi Med 2001 May-Jul;21(3-4):174-177. 8. Normah J, Choo KE, Oppenheimer SJ, Selamah G. Glucose-6-phosphate dehydrogenase enzyme activity in normal, hemizygote and heterozygote Kelantanese Malays. J Paediatr Child Health 1991 Dec;27(6):376-379. 9. Luzzatto L, Battistuzzi G. Glucose-6-phosphate dehydrogenase. Adv Hum Genet 1985;14:217-329, 386-388. 10. Kurdi-Haidar B, Mason PJ, Berrebi A, Ankra-Badu G, al-Ali A, Oppenheim A, et al. Origin and spread of the glucose-6-phosphate dehydrogenase variant (G6PD-Mediterranean) in the Middle East. Am J Hum Genet 1990 Dec;47(6):1013-1019. 11. Orlina AR, Josephson AM, McDonald BJ. The poststorage viability of glucose-6-phosphate dehydrogenase-deficient erythrocytes. J Lab Clin Med 1970 Jun;75(6):930-936. 12. Ragusa R, Di Cataldo A, Gangarossa S, Lo Nigro L, Schilirò G. Low-grade haemolysis and assessment of iron status during the steady state in G6PD-deficient subjects. Acta Haematol 1993;90(1):25-28. 13. Piomelli S, Corash LM, Davenport DD, Miraglia J, Amorosi EL. In vivo lability of glucose-6-phosphate dehydrogenase in GdA- and GdMediterranean deficiency. J Clin Invest 1968 Apr;47(4):940-948. 14. Al-Nood H. Thalassemia and G-6-PD deficiency in sickle cell patients in Taiz, Yemen. East Mediterr Health J 2011;17(8):404-408.